We had an interesting experience last night. I was sitting and reading on the balcony of our hotel room when, from the woods just outside, came a loud, hair-raising howl. It sounded just like one of those horrible creatures in a fifties monster movie just before it kills a whole bunch of people. The sound made the fence behind the hotel look awfully short. We found out later that it was the growl of a puma. 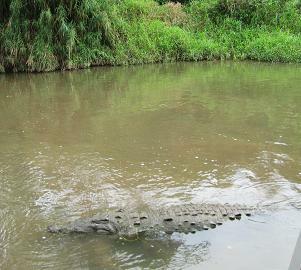 We went on a crocodile tour today. We saw a huge five meter crocodile, as well as a osprey, a kingfisher, a roseate spoonbill, and some other birds that CVH could recognize. This time I could actually see the animals. We could all hear the scarlet macaws, but since it’s their nesting season, none came out for us to look at. I’m not sure why they make so much noise if they’re nesting, but that’s what the guide told us. On the way back from the tour, I also got to see a large black ring tailed iguana climb up a tree right by the road. I felt much better having finally seen some Costa Rican fauna. 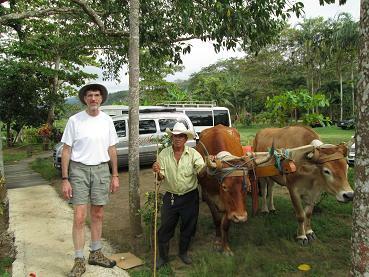 At one stop, there was a man with a traditional oxcart. He posed for tips. 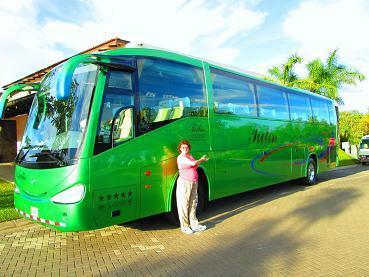 Finally, before we wrap up and come home, here’s a picture of the shiny green bus that carried us all over Costa Rica. 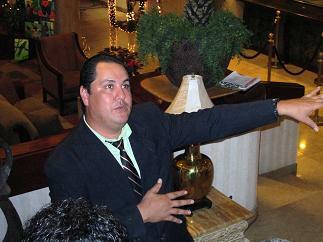 And a picture of our most capable and gracious tour director, José, doing what he does best – directing. So farewell, beautiful Costa Rica; we’ll be back as soon as we can!